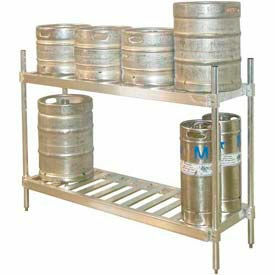 Keg Shelving Units Are Used For Restaurants, Taverns, Warehouses Or Other Beverage Storage Applications. Keg Shelving Units are solidly constructed of corrosion proof welded aluminum for long lasting durability and dependability. Easy load T-Bar style shelve holds all keg sizes. Heavy-duty 1-1/2 inch diameter posts with adjustable bullet feet. Ships "Knock-Down" with easy assembly. Shelves bolt to posts. Anti-slip "Gator Grip" clamps. 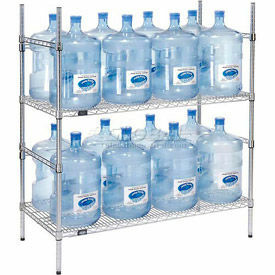 Available in various sizes with 8, 10, 12, 15 or 18 keg storage capacity. 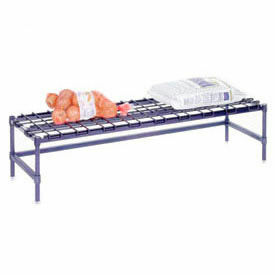 Structural Plastic Dunnage Racks Are Waterproof And Resistant To Gas, Solvents And Most Industrial Chemicals. These high density structural plastic resin dunnage racks endure extreme temperatures and resist corrosion and most industrial chemicals. 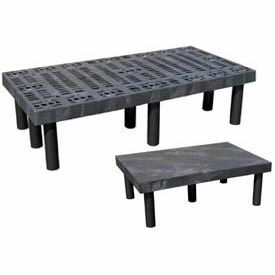 Black plastic dunnage racks have a strong 2-5/8" thick platform and 2-3/8" posts that form a rigid, tool free assembly. Heavy duty plastic is easy to steam clean and disinfect. Great for freezer applications. Lightweight for easy transport and floor cleaning. 12"H overall. Vented Dunnage Racks provide maximum air ventilation, as well as light and sprinkler penetration. Solid Top Dunnage Racks allow extra capacity. Storage Cubes are made of recycled plastic. These storage blocks can be stacked in multiple configurations to fill tight or unusual spaces. 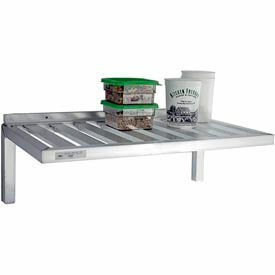 Aluminum Dunnage Racks Allow Nesting When Not In Use For Saved Storage Space. Unique flared leg design handles heavy loads even when nested. Made using all welded 1-1/8" thick aluminum that resists corrosion. NSF approved. Optional Bridge joins racks together for runs of any length. Helps make the best use of space, especially under benches. 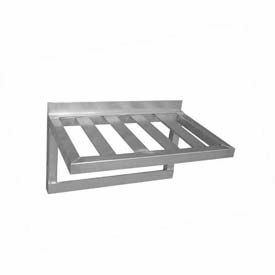 Stationary Low Profile Dunnage Racks Have An Open Front, 3 Sided Frame Design That Allows Easy Cleaning Underneath. 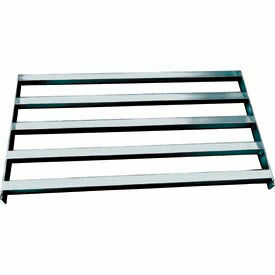 These low profile, NSF Certified steel dunnage racks help maximize storage with minimal space. 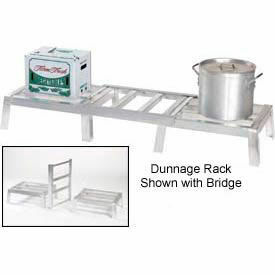 Dunnage racks include a removable top deck, 3-sided frame, post caps and adjustable leveling feet. Measures 14"H overall with a capacity of 1000 to 1600 lbs. per shelf. Nexelon - Blue powder epoxy finish with a Lifetime Limited Warranty against corrosion. * Both finishes contain NexGard®, an antimicrobial agent that protects epoxy coating from bacteria, mold and mildew. 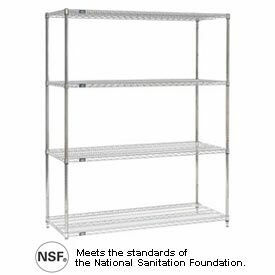 74" Height Nexel® Poly-Z-Brite™ Wire Shelving Provides An Attractive Finish That Is Guaranteed To Last For Years Of Use. The Poly-Z-Brite finish of these wire shelves is so tough that we offer a 15 Year Limited Warranty against rust and corrosion. It features Nexgard, an anti microbial agent that protects the epoxy coating from growth of bacteria, mildew and molds. True powder-epoxy over zinc-chromate electroplating ensures a durable finish that resembles chrome. All units are NSF Certified, can be used for retail display and can also handle extreme temperatures and moisture making it ideal for dry storage, coolers and freezers. Open wire design minimizes dust accumulation and maximizes ventilation and visibility. Easy-slide shelf surface facilitates loading and unloading. Wire shelves adjust at 1 inch increments. Aluminum Cantilever Shelving Units Are Used For Restaurants, Warehouses Or Other Commercial or Industrial Storage Applications. Aluminum Cantilever Shelving Units are made of corrosion proof all aluminum construction for long lasting durability and dependability. 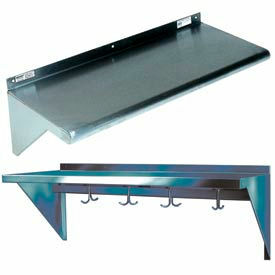 Adjustable solid shelf firmly attaches to 1-1/2 inch diameter posts. Features easy ""lock bushing"" assembly. Available in 12 and 18 inch widths and 24, 36, 48 and 60 inch lengths. 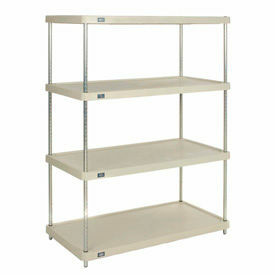 Excalibur M-Shelving Is Used For Providing Versatile, Strong And Reliable Stockroom Shelving Solutions. 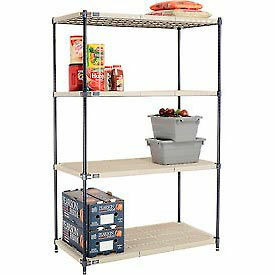 Excalibur M-Shelving is made of fully assembled, corrosion-resistant galvanized steel uprights and shelves for long lasting durability and dependability. Easy to assemble, cost-effective design. Pre-assembled uprights and one-piece adjustable shelves eliminate the need for additional hardware (clips, rivets, rails or support brackets). 5, 6 or 7 level Galvanized Steel Upright And Shelving units are available in 24, 36 and 48 inch widths, 12, 15, 18 and 24 inch depths and 72, 84 and 96 inch heights with 150, 200, 250, 300, 350, 400 and 450 lb. shelf load capacities. 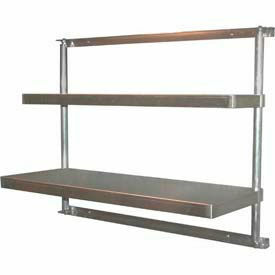 Single 1-1/2 inch Galvanized Steel Shelves available in matching dimensional sizes. Made in U.S.A. Graduated Bakers Racks With Wood And Glass Shelves Are Functional And Elegant Additions To A Variety Of Hospitality, Food Preparation And Retail Environments. Graduated Bakers Racks With Wood And Glass Shelves are available in a variety of sizes and styles to suit storage and display needs. Extra space between top shelf and second shelf allows placement of taller items. Shelf sizes are graduated, with smallest on top. Glass and Wood shelves are available with or without brass tips. Racks are available in a variety of color finishes. 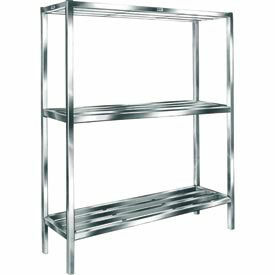 Bakers Racks Are Functional And Elegant Additions To A Variety Of Hospitality, Food Preparation And Retail Environments. 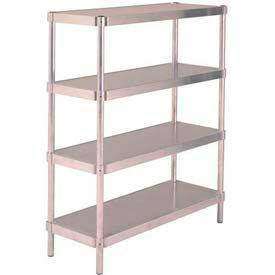 Bakers Racks are available in a variety of sizes and styles to suit storage and display needs. 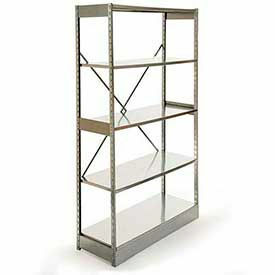 Bakers Racks come in 3-shelf and 4-shelf models, and are available in a variety of metal finishes. Choose from a variety of design styles, including Maple Top Shelf, Brass Tips, Brass Trim & Tips and Glass Shelves. Graduated Bakers And Flour Racks Are Functional And Elegant Additions To A Variety Of Hospitality, Food Preparation And Retail Environments. 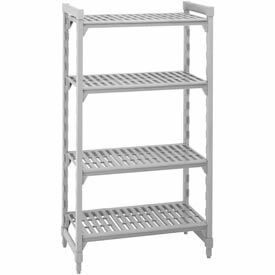 Graduated Bakers And Flour Racks are available in a variety of sizes and styles to suit storage and display needs. Extra space between top shelf and second shelf allows placement of taller items. Shelf sizes are graduated, with smallest on top. 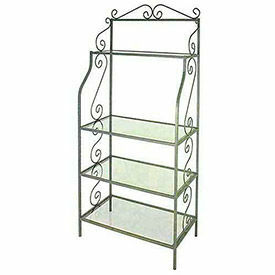 Available bakers rack and flour rack shelf styles are Open Wire or Glass. Racks are available with a variety of color finishes. Bakers Racks With Wood & Glass Shelves Are Functional And Elegant Additions To A Variety Of Hospitality, Food Preparation And Retail Environments. 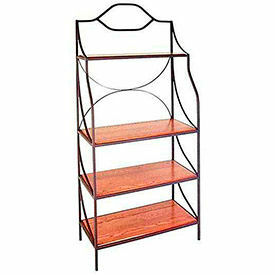 Bakers Racks With Wood & Glass Shelves are available in a variety of sizes and styles to bring a decorative touch to storage and display needs. 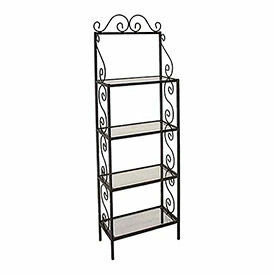 Shelves come in a variety of metal finishes. Choose from Glass Shelves, Wood Shelves, and Glass With Wood Top Shelf. Both wood and glass shelves are available with brass tips. Wood Shelves are available in several color finishes. Corner Racks Provide Space-Saving Storage And Display Areas In A Variety Of Hospitality, Food Preparation And Retail Environments. 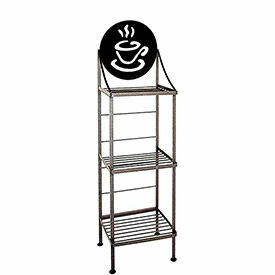 Corner Racks are available in a variety of sizes and styles to suit storage and display needs. Racks are angled to fit snugly in corners to conserve space while still providing a noticeable decorative touch. 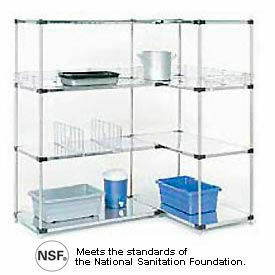 Corner racks are available with open wire shelves or glass shelves. Both options are available with or without brass tips. Corner racks are available with a variety of color finishes. Art Silhouette Bakers Racks With Silhouette Patterns Are Decorative And Functional Additions To A Variety Of Hospitality And Retail Environments. Art Silhouette Bakers Racks With Silhouette Patterns feature a nature-themed silhouette on the top shelf guard for an earthy embellishment. 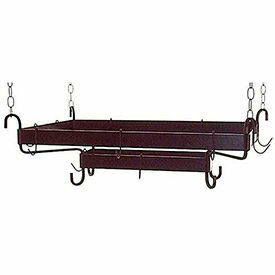 Racks are made with wrought iron and have non-marring foot glides. 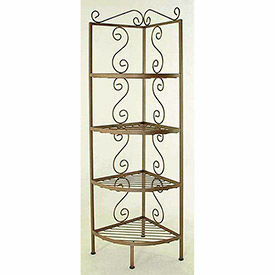 Art Silhouette bakers racks are available in a variety of color finishes and a wide range of silhouette designs. Art Silhouette Bakers Racks With Sports Theme Are Decorative And Functional Additions To A Variety Of Recreational, Hospitality And Retail Environments. Art Silhouette Bakers Racks With Sports Theme are available with a large sports ball image on the top shelf guard for a vibrant, fun embellishment. 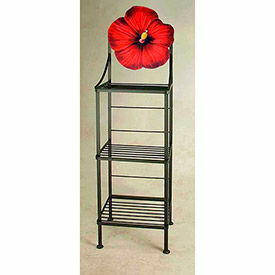 Art Silhouette bakers racks are made with wrought iron and non-marring foot glides. 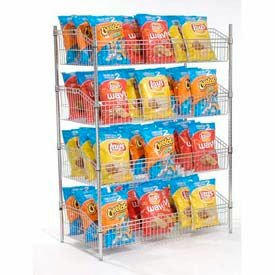 Bakers racks are available in a variety of color finishes. Choose from Soccer Ball, Tennis Ball, Baseball, Football, Basketball, Golf Ball, 8-Ball and 9-Ball. Art Silhouette Bakers Racks With Fruits And Vegetables Theme Are Whimsical And Functional Additions To A Variety Of Hospitality Or Retail Environments. Art Silhouette Bakers Racks feature a large, full-color rendering of a specific fruit or vegetable on the top shelf guard for a vibrant, attractive embellishment. 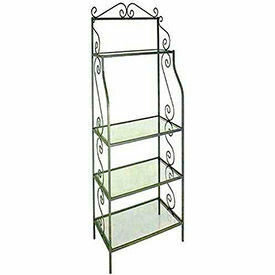 Racks are made with wrought iron and have non-marring foot glides. 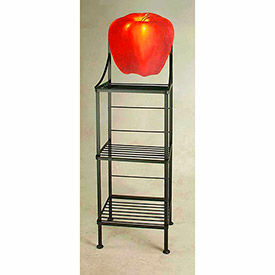 Bakers racks are available in a variety of color finishes and a wide range of fruit/vegetable designs. Art Silhouette Bakers Racks With Flower Theme Are Decorative And Functional Additions To A Variety Of Hospitality And Retail Environments. Art Silhouette Bakers Racks With Flower Theme feature a large flower on the top shelf guard for a vibrant, attractive embellishment. 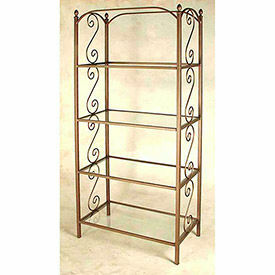 Racks are made with wrought iron and have non-marring foot glides. 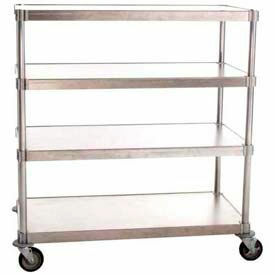 Bakers racks are available in a variety of color finishes. Available flower options are Rose, Hibiscus, Primrose and Sunflower. Art Silhouette Bakers Racks With Lighthouse And Marine Theme Are Decorative And Functional Additions To A Variety Of Hospitality And Retail Environments. Art Silhouette Bakers Racks feature a large nautical-themed rendering on the top shelf guard for a vibrant, attractive embellishment. 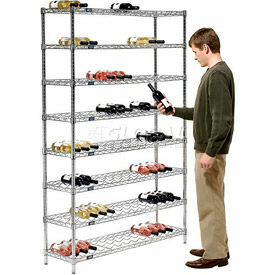 Racks are made with wrought iron and have non-marring foot glides. 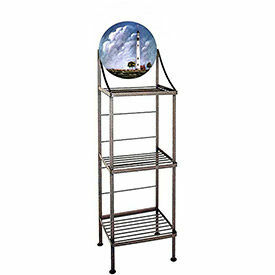 Art Silhouette bakers racks are available in a variety of color finishes and a wide range of lighthouse and marine-themed designs. Wine Racks Provide A Decorative And Functional Means Of Storing Wine Bottles In Restaurants, Bars, Retail Stores And More. 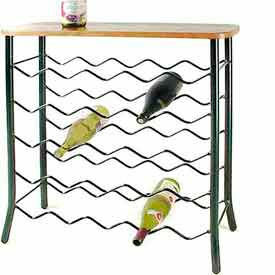 Wine Racks are freestanding wrought iron units that sit on floors, counters or tables to ensure easy access to wine bottles. Wine racks are available in a variety of sizes, styles and metal finishes. Pot Racks Hang From Ceilings And Walls To Create Space-Saving Storage Of Pots And Pans In Food Preparation Areas. Pot Racks are available in ceiling-mounted and wall-mounted models to ensure easy access and organized storage of cookware. Choose from a variety of capacities, designs, and metal finishes. Easels Are Wrought Iron For An Elegant Means Of Displaying Menus, Event Posters And More. 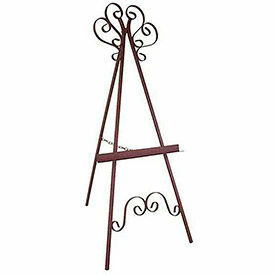 Easels are made using wrought iron for an upscale look as well as years of lasting durability. Easels include safety chain to prevent over-extension. Available designs are Marseilles Style, Paris Style or New Orleans Style in a variety of color finishes. Create The Cantilevered Shelving System That's Right For You Using These Shelving Components. Heavy duty aluminum construction for years of dependable service. Perfect for coolers, freezers and backrooms. Rust resistant aluminum. Create a cantilever storage unit that meets your needs. Uprights hold up to seven shelves on 10" centers. Posts are 72"H and include adjustable leveling feet. Maximum load capacity of 2,500 lbs. 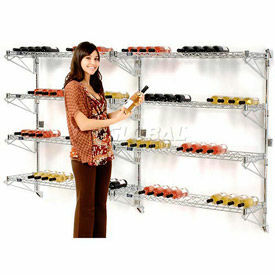 Shelves have a D-front extrusion for safety and easy cleaning. 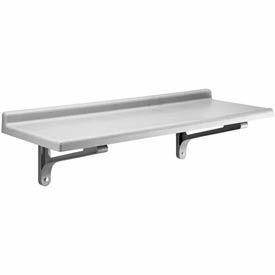 Choose between Solid Shelves, E-Channel Shelves, Tubular Shelves or T-Bar Shelves that easily fit on Uprights. Cross Bracing & Hardware is required for installation. NSF® approved. 5 Year Limited Warranty. Create A Sanitary, Modular Shelving Unit That's Perfect For Food Industry Applications. 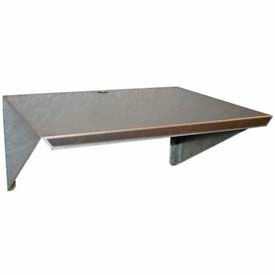 Made using heavy duty, all welded aluminum for years of dependable service and rust resistance. Perfect for coolers, freezers and backrooms. Create a food shelving storage unit that meets your needs. Poles allow shelf height adjustments at 2" increments (shelves sold separately). Shelves are available in 4-styles to fit your varying needs. Solid Shelves offer a 500 lb. capacity. Reinforced shelves offer 800 lb. capacity. 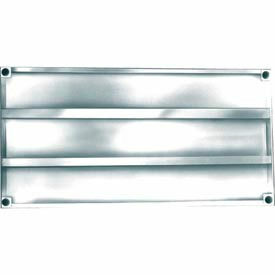 Channel Shelves are made of 4" x 1-1/2" E-channels inside a frame of tubular aluminum; offers 2,100 lb. capacity. 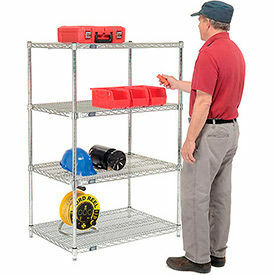 Tubular Shelves are made of 1-3/4' x 1-1/2" cross tubes for improved air circulation; 2,000 lb. capacity. Swivel Casters convert a stationary unit into a mobile shelf truck with 1,200 lb. load capacity. Includes 5" swivel stem casters. NSF® approved. 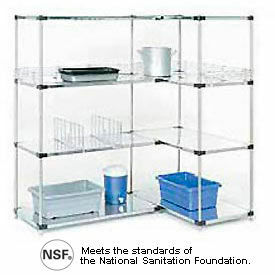 Vented Plastic Shelving Utilizes Ion-Technology That Inhibits Growth Of Mold, Fungus & Bacteria. Plastic shelving is great for storing food in walk-in refrigerators and freezers at restaurant and kitchen environments. Shelves are reinforced with a Camguard™ finish that won't scrape off, wash off or wear out. Made with rust free, recyclable polypropylene that is dishwasher safe. Weldless construction eliminates liquid or dirt penetration. Shelves are height adjustable at 4" increments without disassembling the unit. Posts and bracing is made using a steel core with a smooth polypropylene exterior that's built to last. Posts include adjustable leveling feet. Easy to clean to maintain HACCP compliant hygienic work area. NSF listed. Lifetime Limited Warranty.